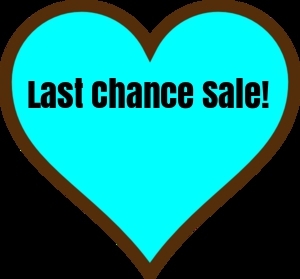 We are having a huge last chance clearance sale in our 3 Etsy shops starting Friday January 27 to Monday January 30, 2017. We will be moving out all our 2016 inventory and making room for our new and exciting 2017 product line. Now is your chance to save big with savings over 50% off select items. In our Markets of Sunshine shop that means our Little Golden book planners are all on sale. There is a limited quantity in stock. First come, first serve basis. In our My Secret Compartments shop all of our reading books are on sale to make room for our new and exciting line of Jane Austen hollow book boxes and memory keepsake boxes. In our Pioneer Fundraiser shop all of our craft supplies, how to books and vintage housewares are all on sale in our shop section named for the Last Chance Sale. See you on Friday. Save the date. Bookmark our shop and come by and favorite your items now. Newsletter subscribers get to take an 15% off the sale prices. Sign-up now to save big during our annual "last chance sale" event. 8 sales so far Wahoo!!! !